A review of the popular tankless electric water heaters from US and Canada and designed for on-demand heating of potable water. Find out about the benefits, advantages and compare the features. A review of top sellers: Stiebel Eltron Tempra, Rheem, and EcoSmart. One is common for all electric tankless hot water heaters; they use electricity to heat water, on demand and in continuous supply, using the heating elements. These are wall-mounted, small, lightweight and compact heating appliances that can be installed on the wall, under the sink, in the bathroom or kitchen, and usually close to the point of use. The greatest advantage is that the standby heat loss, as found in tank-type heaters, is completely eliminated, making them achieve high energy factors. According to the manufacturers, tankless electric units save more energy when compare to the tank-type, and have lower installation costs. Of course, with the on-demand heating and fast water delivery you will appreciate the comfort and convenience more. 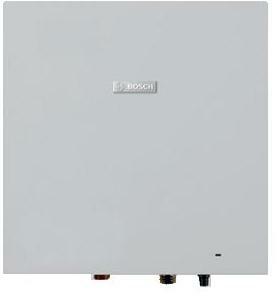 Electric tankless water heaters are designed to deliver hot water to low-demanding applications (single fixture) and whole-house (multiple fixtures), either in a warm or cold climate. Most of the models can work in the range from 80 to 140 F, or more when used in commercial applications. Whole-house electric water heaters can easily replace storage tank-type models, providing more floor space for other use. These are usually wall mounted and centrally located, providing hot water to more than one fixture. Point-of-use water heaters (POU) are designed to deliver hot water to one fixture and are installed either above or below it, and most of the time under the sink. These are used for distant sinks to avoid long runs of plumbing pipes, in cottages, apartments, garage, small offices and businesses. Stiebel Eltron is the German manufacturer of tankless electric water heaters that offer quality models for point-of-use service and whole-house water heating. Stiebel Eltron Tempra 24 Plus is the top-selling model that can be used almost anywhere; from one to two fixtures in colder areas to up to 3 showers in warmer regions, operating simultaneously. Stiebel Eltron Tempra 24 Plus is the most advanced electrical tankless water heater from this company, providing hot water on demand and in an endless supply. So no matter how long it takes you to shower, hot water is always there – for you and for those after you. The heater utilizes heavy-duty electronics, microprocessor, and with its advanced flow control, it ensures the constant temperature of hot water no matter what the water flow is (the minimum is still required to operate). Tempra 24 Plus utilizes only quality elements such as the solid copper heating elements. The combined work of the microprocessor, flow sensor and built-in inlet and outlet temperature sensors will result in modulating operation where the heating elements are engaged in stages. This means that more power is provided for higher water flow and less for lower flow – trying to meet the set temperature with the least amount of energy. The power is at any point of time monitored and adjusted automatically. 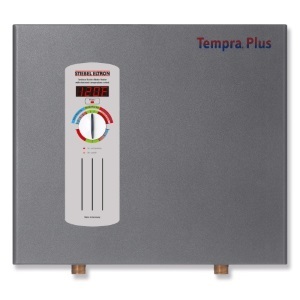 Tempra 24 Plus uses the digital display to show the temperature of hot water and error codes when the problem occurs. According to the manufacturer it is built to replace the tank-type unit, saving up to 20% energy and lots of space. It comes with the 7-year warranty against leaks. 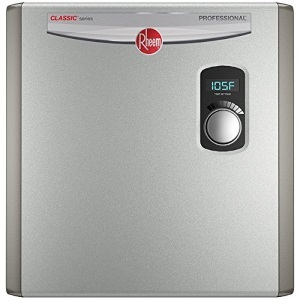 One of the top sellers from Rheem tankless electric water heaters is the RTEX-24 model. As other advanced models, this unit is also equipped with the modulating power control, so more energy can be saved when adjusting the power and water flow. It is equipped with the 3 heating chambers made of copper for better corrosion resistance, controlled by the microprocessor for the precise and comfortable heating. Unit’s digital temperature control is conveniently located at the front of the unit and it allows users to adjust the temperature between 80 F and 140 F, with the increment of 1 F, making the water temperature accurate to the desired and very comfortable to use. As the standby heat loss is eliminated, the water heater is able to generate a stable temperature and efficient operation, where the efficiency is 99.8%. The RTEX-24 model can provide up to 5.9 GPM of water flow which is sufficient even for homes with multiple showers. 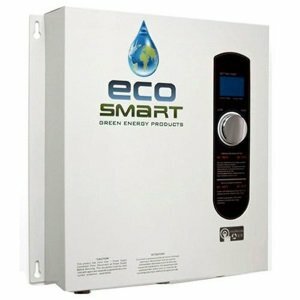 EcoSmart ECO 24 is the medium size electric tankless water heater that is recommended for mid- to large-sized homes as it can heat up to three showers and two sinks simultaneously, in a warm climate. And, as long as the minimum water flow of 0.3 GPM is met, the water heater can easily operate when the small (point-of-use) or a large amount of hot water (whole-house) are needed. At the temperature rise of 77 F, the water heater can provide the maximum water flow of 5.9 GPM, as the Rheem’s RTEX-24 where the temperature of hot water could range from 80 to 140 F.
According to the manufacturer and due to the self-modulating technology, ECO 24 can provide up to 60% in energy savings. The unit comes with a limited lifetime warranty on electronics and heat exchangers, but only when used in residential applications. At the time of writing this article, EcoSmart ECO 24 (with other 5 models) had over 2000 reviews, where over 80% are positive. Tankless electric water heaters are designed not only for one single fixture – some can be used for the whole-house water heating, but it depends on some factors such as the temperature of an incoming water and power of the unit. That is why bigger models can easily replace tank-type models. Electric tankless are small, but they can still use one, two, three or more heating elements and since they draw more Amps, the electrical panels might need an upgrade. And the unit must be hardwired to the panel. As seen from the above, small tankless electric water heaters are heating water on demand and supply hot water to either one single sink/shower or multiple fixtures, and are the perfect supplement to an existing system that cannot satisfy user requirements. The heaters also work great in conjunction with the solar and geothermal water heating systems. Due to the small and compact design, they are easy to install – usually under the sink, in the bathroom or kitchen, or wherever hot water is needed fast. Electric and tankless water heaters just need water and electrical supply, making them very safe. There are no gas connections or venting pipes, providing more flexibility during the installation.